Jackie Stewart was one of those drivers who was so smooth, so precise, that he didn't look quick unless you had a stopwatch in your hand. But Stewart wasn't only about speed. The 1969, 1971 and 1973 world champion is the man who set the template for his era. Always thinking, among his 27 wins are myriad examples of how he out-thought the opposition. His last lap win at Monza in 1969 is the stuff of legend and was the result of a decision to run a long fourth gear for the run to the line. But he was also an inspired virtuoso, as his incredible win in the wet at the 1968 German Grand Prix proved. His relationship with Ken Tyrrell was the most important one in his career. He won the championship for him in Matra and then Tyrrell machinery, and even managed to drag a race win out of an only reasonable March chassis in 1970. His crusade to improve safety standards only adds to the living legend that is Sir Jackie Stewart. 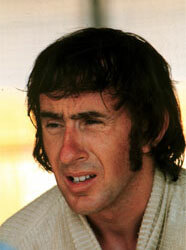 Should Jackie Stewart be higher or lower in F1's greatest drivers?